Deputies discussed issues regarding economic and trade cooperation, as well as intra-bloc investment; reviewed Singapore’s priorities and initiatives for 2018; and updated the progress of activities towards achieving the ASEAN Economic Community 2025 goals. Such contents will be submitted to the 33rd ASEAN Summit and related meetings from November 13-15. Ministers agreed on the fourth protocol amending the ASEAN Comprehensive Investment Agreement, which will promote the construction of an open, free, and transparent investment region that is pointed towards global integration. Regarding the ASEAN Trade in Services Agreement – one of Singapore’s biggest priorities during its tenure of the ASEAN Chairmanship, negotiations have been concluded and the deal’s legal review is currently underway. Participants debated new fields proposed by partner countries for future free trade agreements and wider cooperation frameworks. Singaporean Minister of Trade and Industry Chan Chun Sing presented a brief on the ASEAN member states’ ratification of the Comprehensive and Progressive Agreement for Trans-Pacific Partnership. During the sixth preparatory Regional Comprehensive Economic Partnership (RCEP) Trade Ministers’ Meeting, ministers looked into important orientations directed by leaders that would enable a consensus on market opening, services and investment, and intellectual property, towards basically concluding RCEP negotiations later this year. 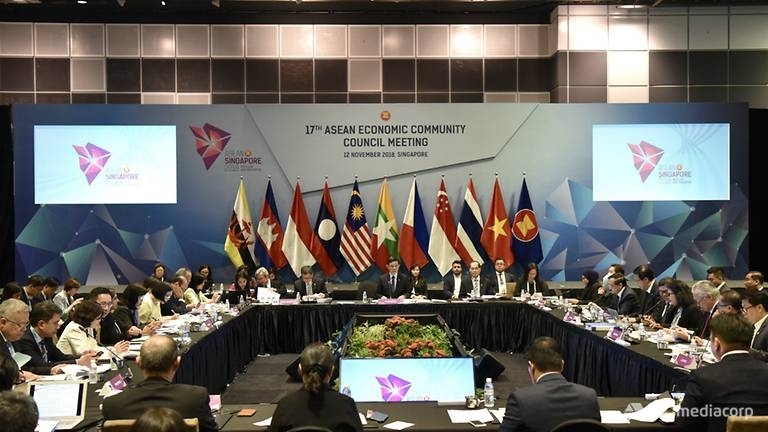 On the occasion, ASEAN economic ministers signed the ASEAN E-Commerce Agreement to promote cross-border trade in the region, narrow the development gap, and fuel sustainable development. It is the bloc’s first independent deal in e-commerce so far, contributing to creating a safe and trustworthy environment for both businesses and individuals.